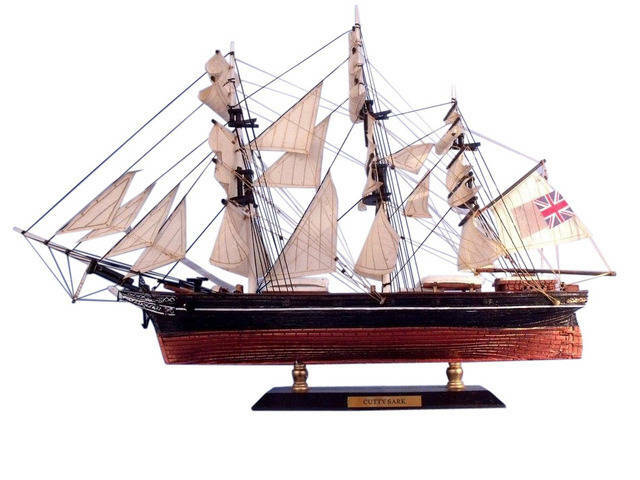 Cutty Sark Limited Tall Model Clipper Ship 15"
One of the fastest clipper ships of the late 19th Century, some say even the fastest of its kind, the Cutty Sark was an impressive vessel in the tea trade between China and London. 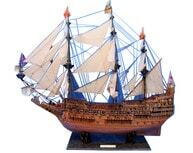 With a fascinating history, this stunning tall ship makes a great addition to any room or office. Display this famous tea clipper ship with pride or give as a gift to a relative, coworker, friend, or an exectutive. She was designed by Hercules Linton and built in 1869 at Dumbarton, Scotland, by the firm of Scott & Linton, for Captain John "Jock" "White Hat" Willis; Scott & Linton was liquidated, and she was launched November 22 of that year by William Denny & Brothers. Cutty Sark was destined for the tea trade, then an intensely competitive race across the globe from China to London, with immense profits to the ship to arrive with the first tea of the year. However, she did not distinguish herself; in the most famous race, against Thermopylae in 1872, both ships left Shanghai together on June 18, but two weeks later Cutty Sark lost her rudder after passing through the Sunda Strait, and arrived in London on October 18, a week after Thermopylae, a total passage of 122 days. Her legendary reputation is supported by the fact that her captain chose to continue this race with an improvised rudder instead of putting into port for a replacement, yet was only beaten by one week. In the end, clippers lost out to steamships, which could pass through the recently-opened Suez Canal and deliver goods more reliably, if not quite so quickly, which proved to be better for business. Cutty Sark was then used on the Australian wool trade. Under the respected Captain Richard Woodget, she did very well, posting Australia-to-Britain times of as little as 67 days. Her best run, 360 nautical miles (666 km) in 24 hours (an average 15kt, 27.75 km/h), was said to have been the fastest of any ship of her size. On the morning of May 21, 2007 the Cutty Sark, which had been closed and partly dismantled for conservation work, caught fire, and burned for several hours before the London Fire Brigade could bring the fire under control. Initial reports indicated that that damage was extensive, with most of the wooden structure in the centre having been lost. In an interview with the chief executive of the Cutty Sark Trust it was revealed that at least half of the "fabric" (timbers, etc) of the ship is not on the site as it is being dismantled for the preservation work, and that they are most worried about the iron framework to which the fabric is attached. Aerial video footage showed extensive damage but seems to indicate that the ship has not been destroyed in its entirety. A fire officer present at the scene said in a BBC interview that when they arrived, there was "a well-developed fire throughout the ship". The bow section looks to be relatively unscathed and the stern also appears to have survived without major damage. The fire seems to have been concentrated in the centre of the ship. The Chairman of Cutty Sark Enterprises who has inspected the site said, "The decks are unsalvageable but around 50% of the planking had already been removed; however, the damage is not as bad as originally expected." It has already been stated that the ship can be restored, the damage being less than at first thought, and with up to half of the original materials currently being stored off-site during restoration. The chief executive of the Cutty Sark Trust did not know how much extra the ship would cost to restore, but estimated it at an additional £5–10 million, bringing the total cost of the ship's restoration to £30–35 million. For a long time, there has been growing criticism of the policies of the Cutty Sark Trust and its stance that the most important thing was to preserve as much as possible of the original fabric. The fire damage has been put forth as a reason for the Cutty Sark to be rebuilt in a manner that would allow her to put to sea again by proponents of the idea. However, the Cutty Sark Trust have found that less than 5% of the original fabric was lost in the fire, as the decks which were destroyed were non-original additions. There are currently two petitions to the UK Prime Minister, one for funds to restore the ship, and the other for funds to restore the ship into commission as a sail training vessel. In addition to explaining how and why the ship is being saved, the exhibition features a new film presentation, a re-creation of the master's saloon and interactive exhibits about the project. Live web-cam views of the conservation work allow the visitor to see remotely the work being carried out on the ship.